In this test we are going to look at how hard drive speeds impact your trading computers performance. Similar to graphics cards, hard drives speeds and their impact on a computers performance can often be misunderstood. Before we get too far into tests let’s just refresh ourselves on what a hard drive is and what job it does in your PC. Basically the hard drive is permanent data storage, it is a space for storing files and folders on your computer and it is permanent storage in that you can switch off your computer and then switch it back on and your files / folders will still be there. Sometimes the hard drive and RAM can be confused, this is because sometimes RAM can be called memory, the size of your RAM is also measured in the same units as a hard drive, megabytes (MB) and gigabytes (GB). RAM is also storage for files on a computer but it is temporary storage not permanent, so when you restart a PC the RAM is wiped clean. Hard drives work slower than RAM but offer a lot more storage space, RAM is much quicker to access and its job is to temporarily hold your open programs and files as you are using them. There are a few different types of hard drives to take into account. Traditional hard drives store your files on magnetic disks, these disks physically spin and are read by a moving head, kind of like how an old style record player worked. To read a file the head needs to find the file on the spinning disk and then read the data from it. A number of years ago drives called solid state hard drives were invented. These store your files on electronic microchips and they have no moving parts in them, this results in much faster read and write performance, and quieter operation as there are no spinning disks or moving parts. Newer hard drives are similar to solid state drives (SSD’s), they just have a faster interface to the computer and the chips used to store data have improved in speed. An M.2 drive is an example of one of these newer drives and is one that we are going to test below. Looking around the Internet you will see websites mentioning how a faster hard drive can ‘minimize drive latency during trades’, or you sometimes see graphics showing the speed differences between different hard drives, but how much of an impact does the speed of your hard drive actually make to using your computer for trading? For this hard drive test we are going to look at a standard SSD drive versus a newer and faster M.2 drive. The Kingston SSD is rated as having a read speed of 500MB/s and a write speed of 350MB/s, the Samsung 960 M.2 drive is rated at 3,200MB/s for reading and 1,900MB/s for writing data, so the M.2 is 6.4 times faster at reading data and just over 5.4 times quicker at writing it (according to Samsung that is…). For the test system we are using an Intel Core i5 7600K CPU, ASUS Z270-P Motherboard, 16GB 2,666MHz RAM, nVidia GT 1030 graphics card, a 600W BeQuiet power supply with an Antec 302 Case and an Arctic CPU Cooler. The only difference between the two systems is the hard drive. The Kingston drive is connected via a SATA 6GBPS port and the M.2 drive is connected via the motherboards built in M.2 data port (the only way both can be connected). For software we have Windows 10 Home edition with Google Chrome v59. The tests are conducted using the Passmark Test Suite and Handbrake 1.07 (64-bit). All the below tests were run three times and the reported results were an average of each of the three test results. The first tests we will run are web browser tests, these are special websites that run a series of tests and functions in an Internet browser and return a performance score generally based on how quickly the test completes. 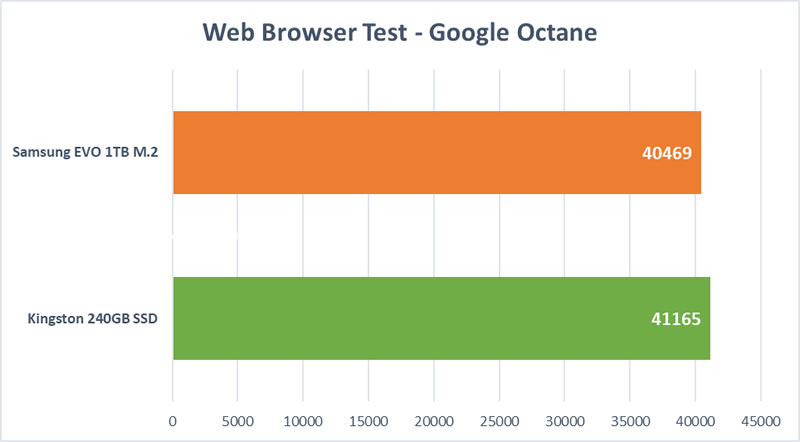 We use these tests as they are almost a perfect way to benchmark the performance of a web browser running a complex website, exactly how many trading platforms operate. These types of tests are also a good proxy for how other software will run on a trading computer as essentially the browser acts as a client receiving and processing data, pretty much the same as any other type of trading software. This first test uses the JetStream website which in turn performs a sequence of tests simulating what any complex trading platform would normally do in its general operation. What we find is that there is practically no difference in how fast this completes between the two drives, the Kingston SSD actually has a higher score but there is less than 0.19% difference between them both, essentially they are equal. 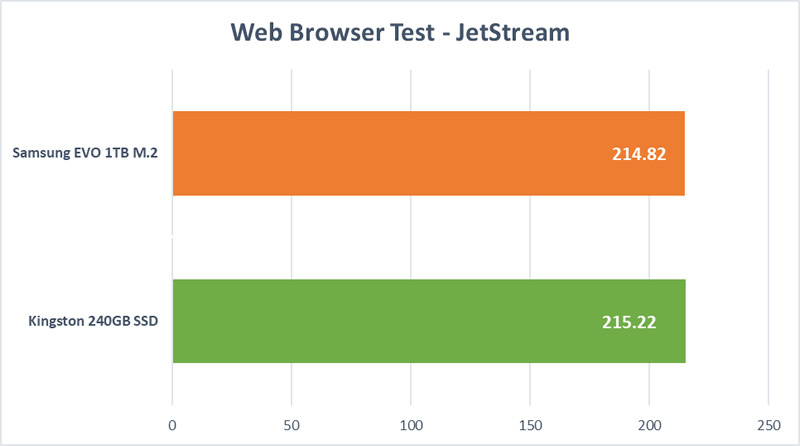 This second browser test is similar to the JetStream one but it is provided by Google, some of the operations it tests are similar but there are differences so it is a good second opinion. Again we see there is very little difference between the results for both drives. The faster M.2 drive comes out slightly worse off than the standard SSD but there is just 1.7% difference which is within a standard margin of error for these kinds of tests. 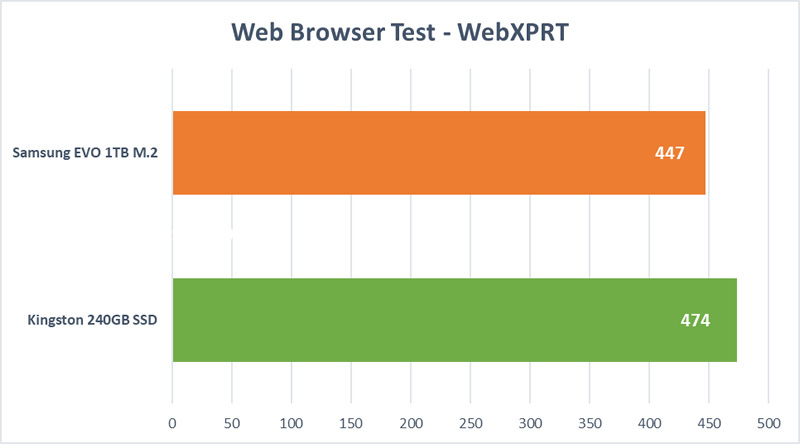 Our last browser test uses the WebXPRT suite which is a little different from the JetStream and Octane tests above as it is more visual, it tests things such as how fast charts and numbers can be rendered in the browser along with the more mathematical calculations. Again, this is a very good proxy for a browser based trading platform. The standard SSD produces a 5.7% higher score than the M.2 drive which is surprising, I would have expected no real difference at all. Digging into the results a bit deeper doesn’t really produce any stand out differences either, overall I’d say this is just about within a margin of error really. To sum up the three browser tests the standard SSD actually scored higher in all three tests than the faster M.2 drive, in reality though there was little between them. The thing to takeaway from this isn’t that a normal SSD is faster for trading, what you should be understanding though is that it is not any slower, or the M.2 drive despite being able to read and write data massively faster actually has not impacted the speed of how the overall computer performs on these tests. Let’s move on to the Passmark Performance test suite and see what it shows. Passmark’s Performance Test is a standalone program installed on the computer, it measures the performance of various hardware inside a machine to benchmark it. The first couple of tests we will examine are the 2D graphics and 3D graphics performance of the trading PC. Graphics performance tests are really testing how fast your computer can draw items on your monitors. 2D graphics are basically things like fonts, lines and vector graphics, whereas 3D graphics are often used in games and more graphical interfaces. Most trading platforms use 2D graphics as they are quicker and easier to output and are all that is needed when drawing charts and listing market pricing tables and information. 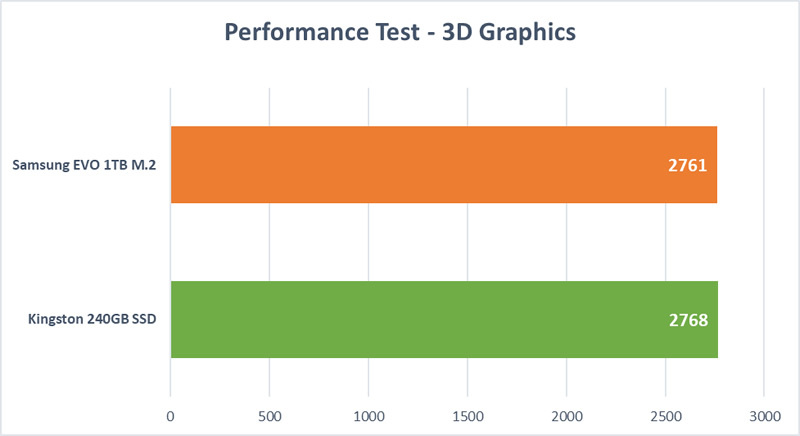 Here you can see that the speed of your hard drive has zero impact on the speed at which your 2D or 3D graphics performs, the differences in results are 0.41% and 0.25% respectively so basically there is nothing to see here. The heart of any computer is the CPU (or processor), this is what takes inputs and calculates outputs. 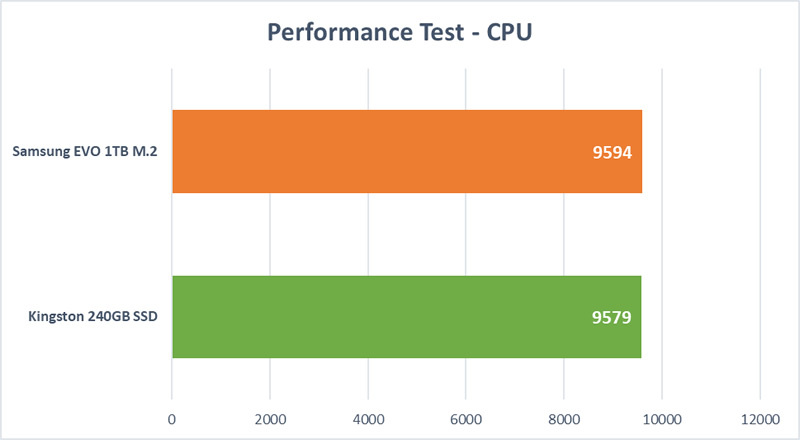 Our Passmark Testing Suite has a number of CPU tests available for us to benchmark performance. This main CPU test is made up of a number of sub-tests which take into account various mathematical simulations like number sorting or physics simulations, very CPU intensive workloads. As you may have guessed from the previous tests, this is showing virtually no difference between the M.2 drive and the SSD, just a 0.16% difference. The single thread speed test is a sub-test of the main CPU test above, this one is only concerned with how fast the CPU can process instructions ignoring any multi-tasking abilities. 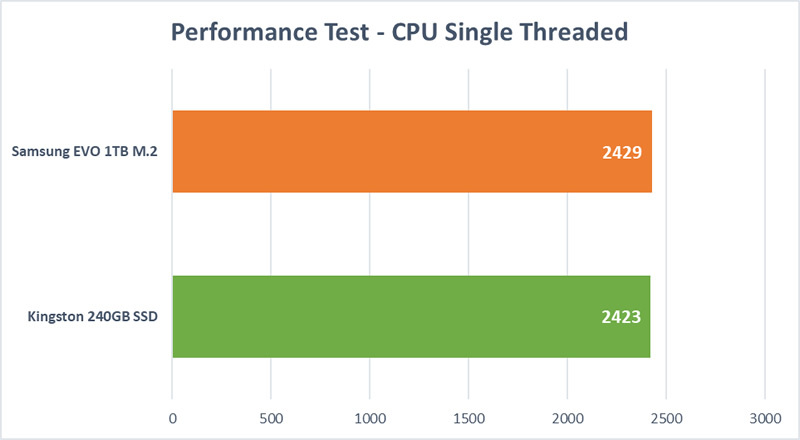 This is often a good test to gauge the overall ‘speed’ of a processor. Mirroring the main CPU test above, the difference between the drives is just 0.25% which is negligible by anyone’s counting. 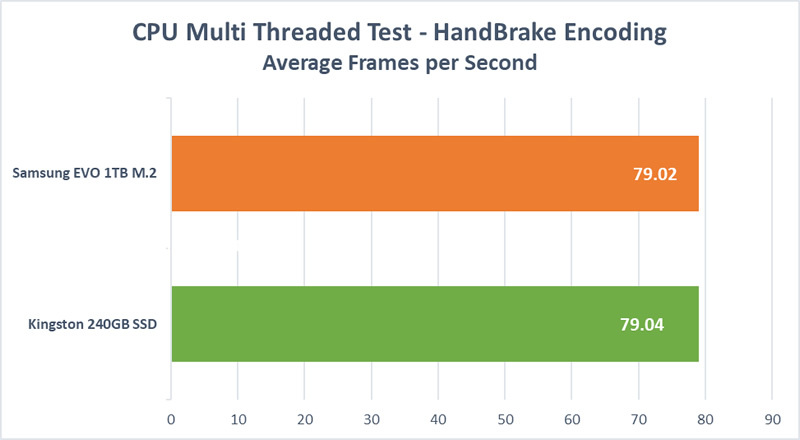 Handbrake is also a CPU test but this attempts to measure the multi-tasking / multi-threaded capabilities of the processor. Some very CPU intensive workloads can take advantage of multi-core CPU’s (processors with more than one CPU on it), Handbrake is one of these programs. The test is to get Handbrake to change one type of video format into another, something that really stresses a CPU, we run the job and measure how many video frames the computer can process per second to get a result. This could not have been much closer with a less than 0.03% difference between the drives. Looking at the three CPU tests it is clear that the speed of the hard drive has zero impact on how the overall computer performs in these tests. 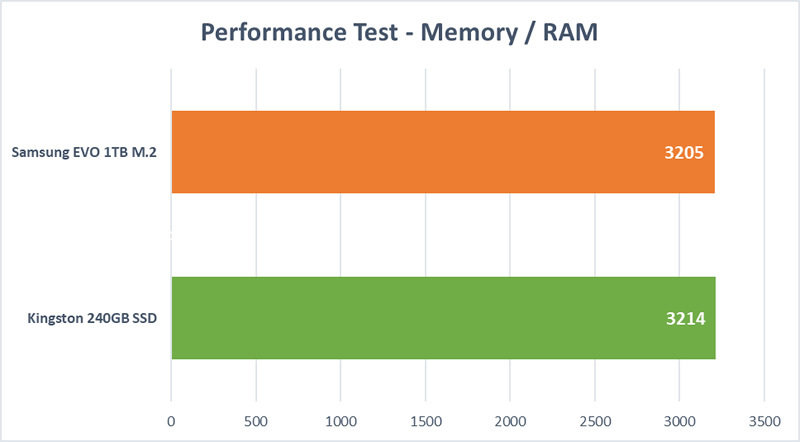 As I mentioned in the introduction, RAM is temporary storage for your computer, our Passmark Test Suite can benchmark RAM to give a performance score, let us see if the hard drive affects the RAM speed. No, the speed of the hard drive has no impact on how fast your system RAM is going to perform at all, the recorded difference is less than 0.3% between both tests. Our final individual component test is the hard drive test, this specifically measures the speed of reading data from and writing data to the hard drive, along with sub tests such as measuring how fast the drive can find data. Finally, and as you might expect, we have a clear winner. 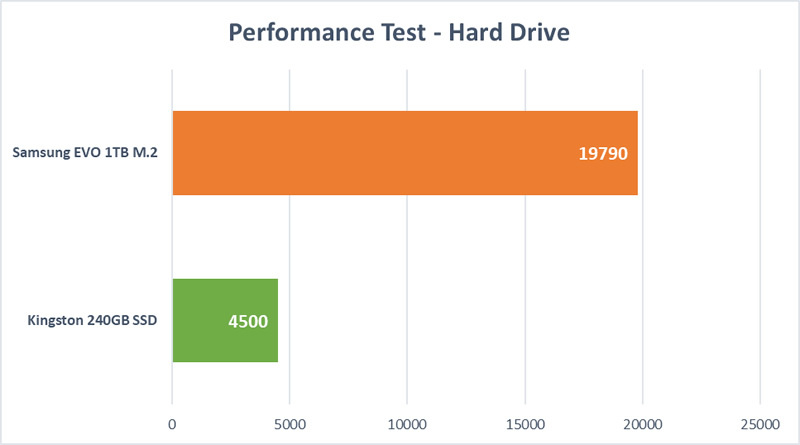 The M.2 drive smashes the normal SSD on this test by an almost 340% better score. Drilling down into this result the M.2’s read score was 6 times better than the SSD, the write score was 3.8 times better and the data seek time was 2.8 times better. So, the M.2 is genuinely faster at all three key operations leading to this big win. What have we learned from these performance tests? Firstly, it is clear that the claims from the manufacturers of 6 times better read performance was pretty accurate, the write speed was not quite 5.4 times quicker but it was still almost 4 times so that again is fairly accurate. If you look at the component tests for things like the CPU, graphics cards and RAM, our test suite showed identical performance levels between the two drives, this tells us that having a faster hard drive does not impact how fast the CPU, graphics card or RAM actually works. In a way this is to be expected, why should the speed of one component impact the performance level of another in an isolated test? That leaves us with the web browser tests, for me these are the key tests as results seen in these is a sum of the entire computers performance, a web browser loads from the hard drive, is transferred into RAM, uses the graphics card to display images and output, and performs calculations using the CPU. That is pretty much how any computer program works, whether it is a trading platform like TradeStation or NinjaTrader, or something like Microsoft Excel or Word. The web browser tests show us that the clearly faster (in terms of hard disk performance metrics) M.2 drive has no impact on how fast these tests and tasks complete. That’s right, a hard drive that is technically up to 6 times faster than a normal SSD has absolutely zero impact on how fast your programs will run when they are open. The reason is down to how computers work. When you run any program what happens is that the system files for that program are read from your hard disk and are transferred into your system RAM, when you use and interact with the program you are using it out of your RAM not your hard drive. Running programs do not really use the hard drive apart from when they first open and then when you save a file. So in something like Microsoft Excel, opening a file uses the hard drive briefly and then saving the file again briefly uses the hard drive, but when you are working on the file it is in RAM. These brief uses of the hard drive are not really a system bottleneck so having a drive such as an M.2 drive will speed up these brief interactions but will not make any impact on a running program. As a business owner it can be frustrating when I see other companies claiming that things like a faster hard drive will improve your trading computers performance. There are a few companies who claim to be experts at building trading computers that imply this, and as we have discovered its complete crap. The difficulty is that unless you have a good understanding of how computers actually work then it is easy to be misled. A headline of saying that this hard drive is 6 times faster than that one looks great, but saying that this will ‘minimize drive latency during trades’ which is something one company is currently claiming is a pure fabrication. Other companies put nice little charts on their pages showing the difference in drive speeds between standard SSD’s and faster PCIe or M.2 drives but they don’t bother to explain that this is a pointless metric which has no impact on your trading software’s performance. Personally I think that if they are doing this then they are either blatantly trying to lie to you or they are pretty incompetent and have no real idea what does and doesn’t impact on a computers performance. Either of those two options should be enough to stop you spending hundreds or thousands of pounds on a trading setup from them. Likewise, if you were considering a new trading computer build and are deciding whether it is worth the extra money to go for a faster hard drive then the answer is not really. You’d be better served opting for a faster processor as this will impact your trading systems performance levels. The problem is that if you don’t know that these metrics are pointless then it is very easy to be misled. Hence the very reason for this website and these types of tests. I hope this helps you, if anything is unclear or you’d like any further information on this or anything else just let me know in the comments below. This is an outstanding service for traders. For a non-techie, the computer thing is a minefield of misinformation. It mirrors the trading education business! Honesty and candor are rare qualities. Yours is very much appreciated. I wish you were in the US!